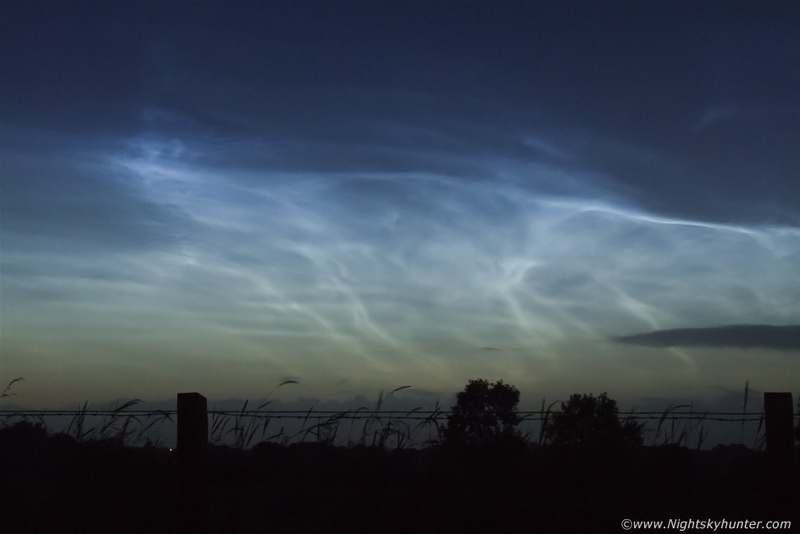 On the night of July 13th 2006 I was in my bedroom watching a DVD since it was a cloudy night when suddenly after 02.00 I got a text message from veteran NLC observer John C. McConnell alerting me to the presence of NLCs. I quickly ran outside with my camera and tripod in hand while wrestling with my jacket. Sure enough the clouds had broken and a wonderful clear sector had opened in the N revealing a surprise NLC display so I ran into the countryside panting in the richly scented Summer air and set-up my gear at the side of the road and began taking images with my old Fujifilm Fine Pix S5600 5MP bridge camera. The NLC display was beautiful with dramatic forms which reminded me of two silvery-mained Stallions galloping across the stars from right to left with ghostly legs and flowing tails. However when I look at these images now I consider the tail to be quite suspect, in fact, the tail is way too long to be a Horse and to me it has a more reptilian quality, perhaps these were actually a pair of ghostly Velociraptors on the hunt? * All images are available for sale in the form of photo prints, canvas or digital files for licensing, if you are interested in a purchase simply drop me an email.